“I didn’t realize, I was looking at my bank statements.. What are all these deposits? Without me promoting it, people were buying photos online at a higher rate. There were enough sales there to make a meaningful impact." Capture more sales with a custom branded online photo/video store. Photos/videos are made automatically available online, helping you easily sell to those that have left. Simply upload your photos or videos, and you're done. 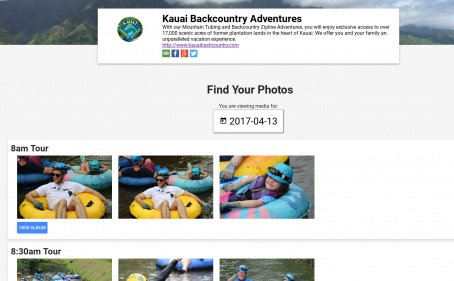 Your photos can be added to the PicThrive Workspace the day of or after your guests take their tour - our platform is made for all types of tours and internet conditions. Your guest can easily buy their trip photos or video after they have left your trip, from any device and anywhere. After quickly buying, they can immediately share, download & interact with your brand. Capture sales after guests leave their tour by sending them to your online store. Our platform automatically alerts and connects guests to their available photos for easy buying.